The best kind of diet is not a diet. That's right, diets are not permanent solutions; at least not the fad diets. If you think about it everyone is on a diet of sorts, so to say one is dieting is really to state that one is eating. What is more important is what our diet is comprised of. Fad diets demonize food and create conflict that triggers remorse, guilt and hedonism. Have you ever walked by a lawn that had a sign proclaiming "DO NOT WALK ON GRASS". What was the first thing you wanted to do. Of course you stepped on the grass. Diets trigger many of the same responses as the grass sign. One way to start a journey toward wellness is to build a personal food philosophy. Consider it a sort of personal nourishment mission statement. The majority of the foods you consume must line up with the guidlines set forth in your philosophy. This prinicple centered approach will become your nutritional and culinary compass, which will help guide you along the way, the same as a compass might help you in the wilderness. It will even allow you to veer off course every so often because you know how to get back on track. Below is a list of the principles that guide Pink Ribbon Cooking™ and inform us of why we cook, why we share the table and why it matters. Please feel free to openly adopt this list or to create your own and share it with us, or the world. 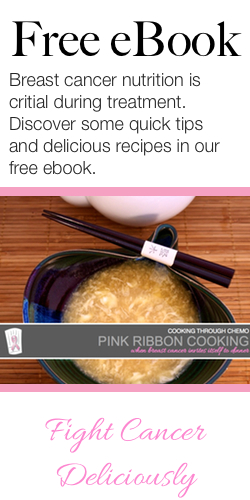 Every recipe we do for Pink Ribbon Cooking owns to our philosophy. This helps us stay on track and offer recipes that are simple, healthy and delicious. Remember that life is a journey and our "diet" is our the food give us fuel for our travels. The better the fuel the better then engine. Like any good road trip accept and plan that you will go off course once in a while. This is part of life and I woudl not ever change this just make sure you know how to get back on the road.